Have you been waiting for EcoRock from Serious Materials? The mass production facility is on hold at the moment. The drywall is ready. The customers are not. 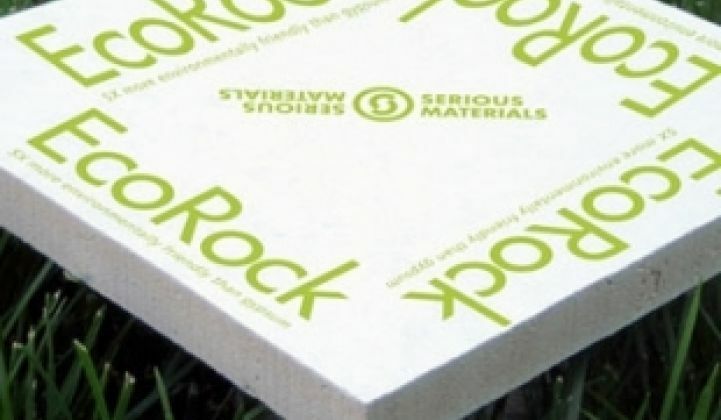 Green building product manufacturer Serious Materials has completed the formula for EcoRock, a version of drywall that requires far less energy to manufacture than standard drywall, and Serious is making it in its pilot plant in the Bay Area, says CEO Kevin Surace. Nonetheless, a full-scale production plant is currently on hold because of the lingering hangover in new construction. "Gypsum (drywall) plants are 75 vacant," Surace said. "New construction is down 80 percent from the peak." The delay could cast a shadow over Serious as well as the green building materials market. Serious helped put the sector on the map and generate interest among investors and entrepreneurs into things like insulation, flooring and cement. The company has also generated a tornado of positive publicity over the years: Inc. magazine, for instance, recently named Surace its entrepreneur of the year, and The Wall Street Journal, BusinessWeek and the World Economic Forum have all given Serious awards. The typical tech-company scale issues combined with the global financial debacle pushed the debut date further out. Serious began to issue beta samples to contractors in early 2009 and it received environmental certification from Underwriters Laboratory in June 2009. Some EcoRock product started shipping to designer homes in California, but a large commercial launch, and a factory opening for volume production, has yet to transpire. "We've had plans, but never pulled the trigger" on building a volume plant, he said. Meanwhile, Serious used some of its funds to buy window companies, staring with Alpen Windows in the middle of 2008, in order to get into the business of thermal windows. Following Alpen, it bought factories in Illinois and Pennsylvania in 2009 and rehired some former workers. Serious has over 300 employees and continues to hire. It is not at capacity yet -- the factory Serious bought in Chicago could employ up to 600 alone, although only 250 worked there before the acquisition. Nonetheless, sales are coming in. Serious, for instance, is supplying windows to the Empire State Building. The difference between the window business and drywall lay in the target markets. The windows are bought by contractors performing energy efficiency retrofits, one of the few growing areas in construction. The drywall is mostly targeted at new construction: builders integrate it to earn LEED points for projects. The pilot plant is big enough to supply drywall to Northern California, where construction is down as well. "Our retrofit lines are fine. All of the new construction stuff is slow." Serious has also continued to purchase other companies, with a total of five companies purchased so far. Some of the acquisitions have not yet been announced. The acquisitions are being financed in part by a $60 million round raised last year. Serious has raised $120 million in all.